Oh My Shih Tzu the temperature is rising, so it’s important to know a few simple ways to keep your dog cool in the summer. Unlike us humans, dogs can not keep cool by sweating. Yes they may sweat a little through their paw pads, but when temperatures & humidity begin to rise you’ll see your pooch begin to pant. But panting alone may not be enough to cool your dog down. Misters are a great way to keep your dogs cool if they are outside. Misters can easily be found at your local home improvement store with prices starting around $30, they make for a quick weekend project, only taking an hour or two to install. Make sure when you install them you decide on a location in your yard that is shaded for added coolness. 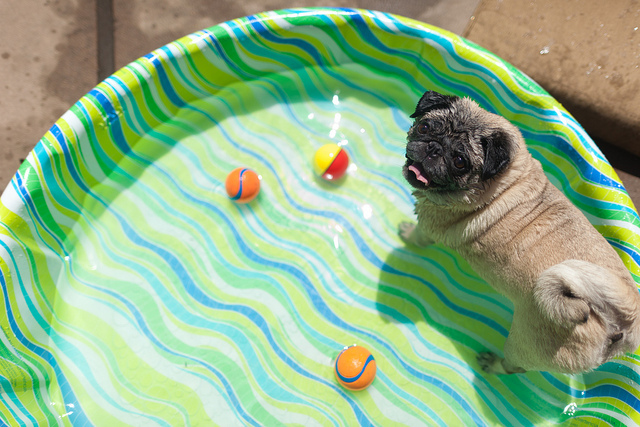 Unlike a regular in ground pool, kiddie pools can be a safe little oasis for your dogs to cool down. But remember, place the pool in a shaded location to keep the water cool as in hot temps the water can warm up very quickly. I love Cooling Pads! They are very portable and I usually just slip it into my backpack when Riley and head off to school. Made of a safe non-toxic gel, once your dog lies on them they begin to cool the tummy area! Riley loves hers so much I don’t even have to tell her to lay on it, once it gets set on the floor she is immediately on top! Now that is one cool puppy! 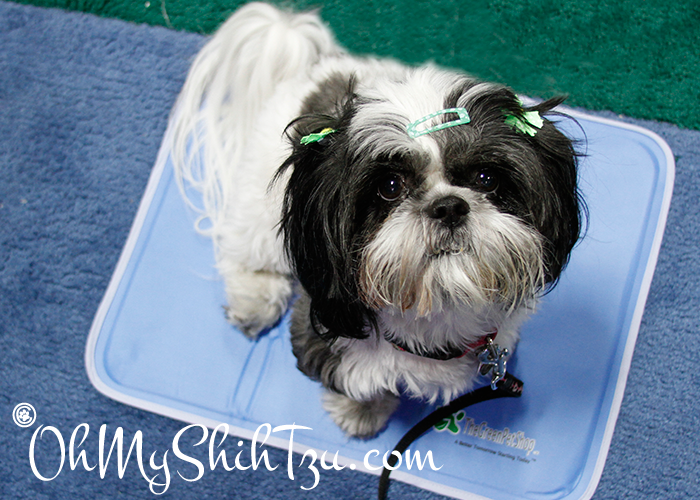 My favorite cooling pad is by The Green Pet Shop! I’ve had mine over a year and it is awesome! Though this maybe obvious, keeping cool water on hand is one of the best ways to keep your dog cool from the inside out! This is as easy as putting ice cubes in the water for extra coolness, or even making your dog ice pops to lick. Though I do make homemade ice pops, we will have a great frozen treat next Tuesday, I sometimes turn to Ice Pups by The Honest Kitchen. These tasty treats are mixed with water, frozen and served for a yummy lo-cal treat to the girls. This is my favorite! Some good quality time with your pooch. Not only is this great exercise for you, but your pet also. If you dog is not accustomed to swimming, teach them slowly that the water is a good thing. Never throw a dog into a pool, it is a myth that all dogs can swim. This can be very dangerous if the dog is brachycephalic (smooshed nose) as they can intake a large amount of water very quickly. 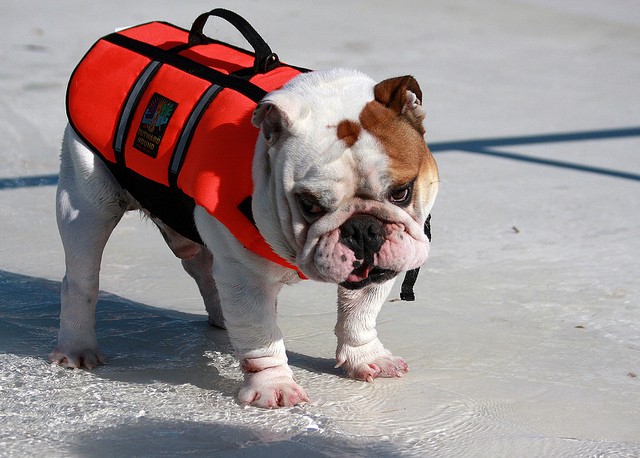 To be safe, if you have a little dog fit them with a proper life jacket. Remember, never leave your pet unattended around a pool, just as with children, accidents can happen very quickly. Check out Ensuring Your Dogs Safety, Pool Fencing regarding the recent addition of a pool fence to our yard. 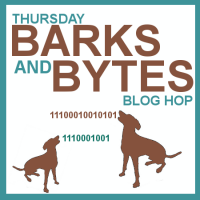 We are so happy to once again be participating in Thursday Barks and Bytes Blog Hop Co-hosted by 2Brown Dogs and Heart Like a Dog. 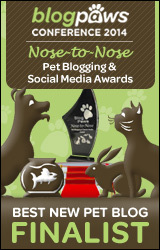 « Wordless Wednesday: Are You Ready? 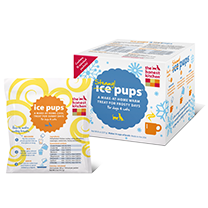 We have our first ice pups from THK and I can’t wait to try them. Our go to is the kiddie pool. The dogs don’t like misters and they don’t like clothing so no outfits (and we’ve found a couple that work). Having tile and hardwood keeps them cool too. Thanks so much for joining the hop. Those are excellent tips. You are right about teaching a dog to swim slowly. We even do that with our Chessies. 🙂 Swimming is now one of their favorite ways to cool off. Ice cubes are a favorite way to increase hydration here. By the end of the month Dog Dad will have installed the AC’s to keep the house cool. I refuse to be outside unless my Human is with me. Around these parts, starting in late May, evening temps are in the 70’s…lately it’s been upper 70’s with temps in the 80’s by sunrise climbing into the 90’s by mid to late morning. Sudden heat in the spring, you know, the day before is cool and the next day is like summer, animals can quickly die from heat stroke. This is more common in the northern states. We don’t get as extreme temperature swings here in the southeast. I think Torrey would love a cooling pad, she likes the cool floor. I’m thinking about getting a kiddie pool for Jack & Maggie this year. Even tho they are retrievers, they don’t get much exposure to water…I wonder if they will like it. Bailie and I like to be in our pool, she plays, I like to just lie in the water. I have more on that on my post today. We also have our Kool Kollars that can be filled with ice. Stay cool!